Working in association with BSS Audio, Waves has now modeled this long-unavailable unit, bringing back its diverse functions and sounds, and adding new features for extra flexibility and ease of use. BSS DPR-402 can be used as a straightforward compressor, limiter or de-esser. But it really shows its colors when these processes are combined, and when it is used to selectively process individual parts of the audio band, leaving the rest of the spectrum untouched. The endless possibilities range from low-frequency expansion and narrow-band compression to general dynamic equalization to create surprising enhancement effects. 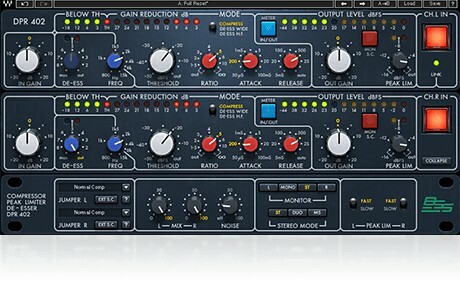 Waves has also added five features unique to the plugin: an MS matrix to separately process the mid and the sides, a Mix control to balance the processed and unprocessed signal, a Noise control to add or remove the modeled noise of the original unit, a Gain Reduction control, and an option for separate L/R metering.